Preserving 'Full Throttle' 22 years later. Tim Schafer is smiling and shaking hands with a hovering crowd as I sit down next to him. A college student asks if she can talk with him later about his career. A fan thanks him for his work -- a library of iconic video games that stretches back to the early '90s. He takes the time to respond to each of them, encouraging the student and graciously accepting the fan's gratitude before sitting down to walk me through a demo of Full Throttle Remastered, an HD remake of one of his first games. I ask him if it was strange to revisit a game he created over two decades ago. "It kind of reminds you of the lessons you learned, but forgot," he said. "Like, put a bunch of explosions on the cover of your box. That did really well for this game. I keep forgetting to put more explosions on the covers." The question was cheap bait; a ploy to see if the seasoned game designer had any regrets about how Full Throttle turned out in light of the experience he'd gained since. He didn't take it. If anything, he reveres the original version of game as something that needs to be preserved. "This is really important to me," he said, prompting me to press the PlayStation 4 controller's touchpad to switch from the game's redrawn HD graphics to the original pixel art. "When I play the Special Edition of Monkey Island, for example, I really appreciated that the game existed if I wanted to see it, exactly as I remembered. I could play that version. Then I'd play for awhile and I'd want to see the pretty art, because it's hurting my eyeballs." Schafer loves what the repainted animation does for Full Throttle's cinematic sequences, but some things were better left unchanged. Not a single line of new dialogue was recorded for the game's remaster. "The original voice actor, Roy Conrad, has passed away since we made this game," he said. "We wanted to just kind of do the Blu-ray version, if you will. The nicest version of his voice." Using the original reel-to-reel recordings, Double Fine remastered Conrad's voiceover into a new stereo mix. "He's irreplaceable, I think, as Ben Throttle." 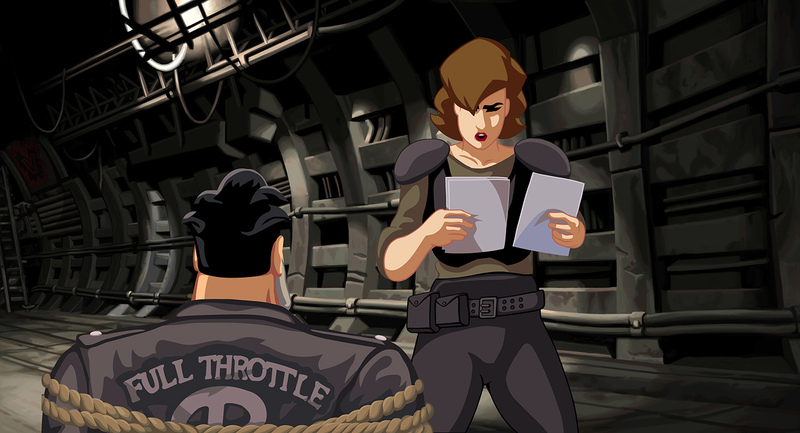 Schafer even went through the effort of recreating a rare 1990s magazine pack-in demo for Full Throttle Remastered's GDC debut, just to make sure all of Conrad's voice work was heard. "Ben had some special lines he only said in the demo." "When I first pitched this, the management was a little worried. They were like, 'Are they going to be selling drugs and killing people?' and I was like, 'What are you talking about?! Bikers don't do that!" Schafer may have always had a love for motorcycles, but this idea of Biker culture was a little romanticized. After reading Hunter S. Thompson's Hell's Angels: A Strange and Terrible Saga, he decided to keep the game squarely in his idealized vision of biker gangs. "They're not going to do everything the Hell's Angels do," he said, "but I did pull themes of, you know, how much authenticity matters to them and how they want to live, in a way, apart from society." 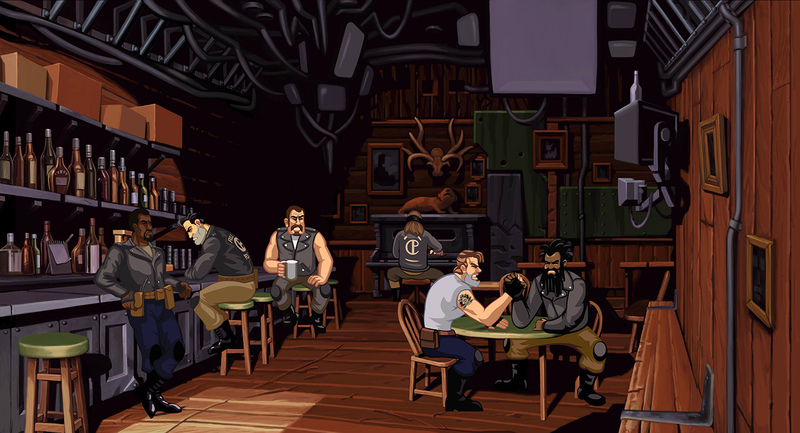 To build the world of Full Throttle, Schafer mixed truth from Thompson's work with themes pulled from Akira Kurosawa's Yojimbo, The Road Warrior, Hellboy comics and more. He compares his version of bikers to like pirates, or cowboys. "All these things, trying to create this stoic hero in a wasteland." Remixing his lifelong obsessions into new and unique worlds has always been key to Schafer's style. Any visitor to his San Francisco office can plainly see the collection of heavy metal albums that helped inspire Brutal Legend. "I feel like if you're doing something new, you pull from all these things," he said. "Your brain retains all this. Not necessarily whole works of art that you've taken in before, but the feelings you get from them and wanting to create that feeling again, by breaking it down to its elements." His love of engines turned into over-the-top vehicles in Full Throttle, Brutal Legend and even Grim Fandango. "I love hot rods and loud engine roars," he added. "And it's fun for the sound designers!" Not all of his interests coalesce into game ideas, of course. "There's also things I've been into that I've never done anything with," he said. "For a long time I was really obsessed with like, hong-kong wire fu. Jet Li and Jackie Chan movies." Schafer also says he's been reading old science fiction and playing a lot of board games, but doesn't seem convinced they would make good video games. "Would that be fun? Like, you don't ever get to play the board game, you just have to play the people who are." He thinks about it for a second longer. "Or you're trying to get your family to play games with you, but they don't want to. That's the main puzzle!" A adventure game about navigating the social structure of a family game night sounds like the perfect platform for Schafer's quirky brand of humor, but he's not serious. "I do go through these phases," he said. "I was really into film noir, and that's where Grim Fandango came from, but I really can't say." Tim Schafer is playing a lot of video games, reading old books and, as always, listening to heavy metal. If any of these new obsessions are influencing his next game, he's not telling. "It's all secret future stuff. It's not formed yet! It's not formed in my head!"